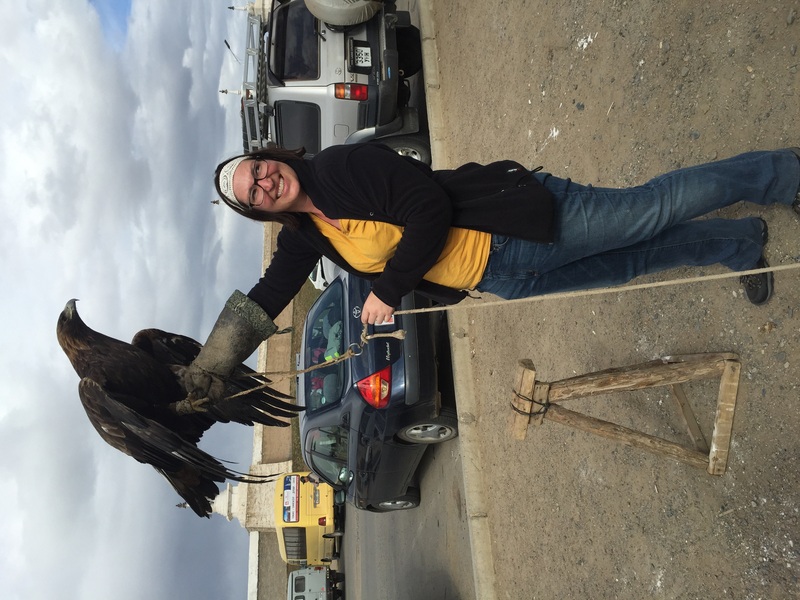 I have absolutely loved Mongolia. Every day that I have been here has brought some other great experience, and it’s very hard to imagine how anything else on our trip can top this. I am seriously thinking about coming back, taking a couple of days of vacation after my next work trip to Beijing and finally taking the train to Ulaanbaatar. I could spend a day in the city, see some of the museums I missed this visit, and then fly home through Beijing. I would really love to do that. 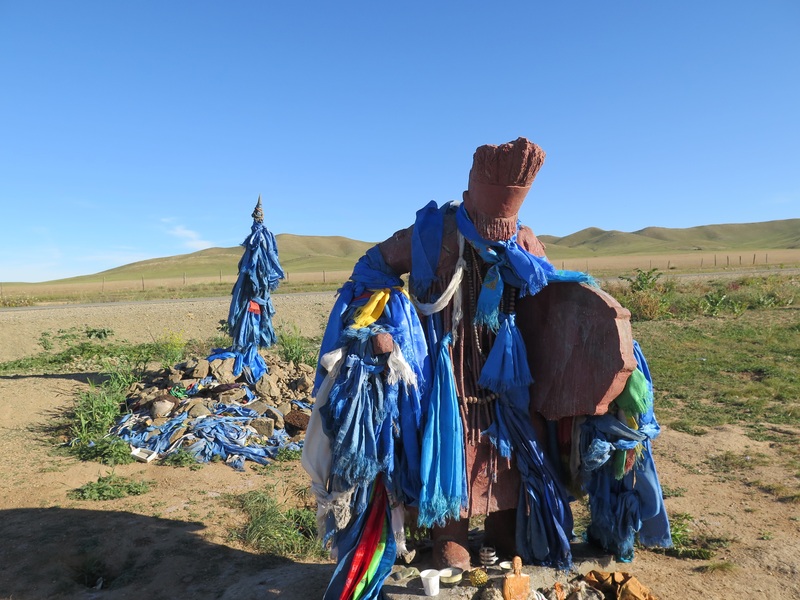 One of our first stops on the way out of Ulaanbaatar was at a roadside memorial/monument. I wish I could remember everything that Meg told us about this stop, but here’s what I can pull up: There were two monuments. 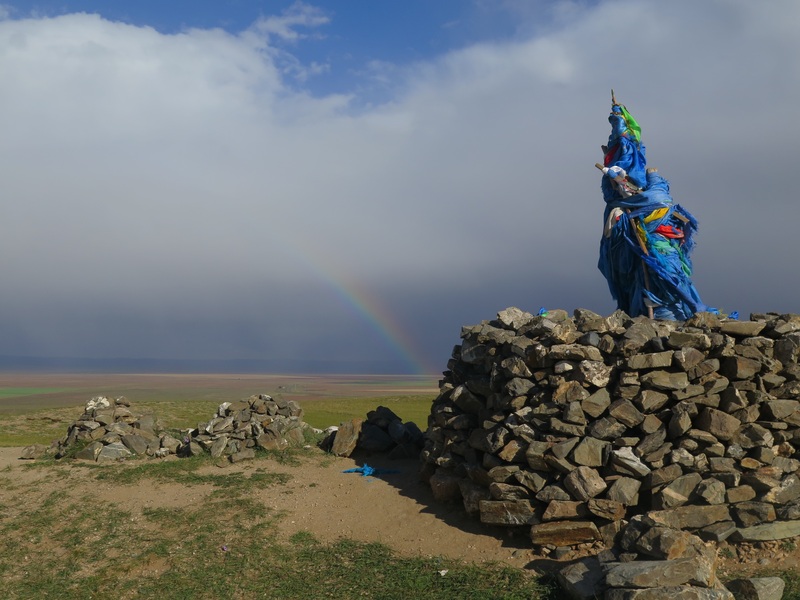 One was Buddhist, and we would continue to see these on the tops of hill throughout Mongolia. (You’ll notice them in other pictures I’ve posted: piles of rocks with poles and fabric scarves wrapped round the poles.) The other was shamanistic: a statue of a shaman with many offerings at his feet. The shamanistic monument in the front, the Buddhist in the back. Another one, with a rainbow. Both Meg’s 5-year-old daughter and the nomads independently remarked on the sizes of Steve’s and my noses. I guess we have remarkable sniffers. 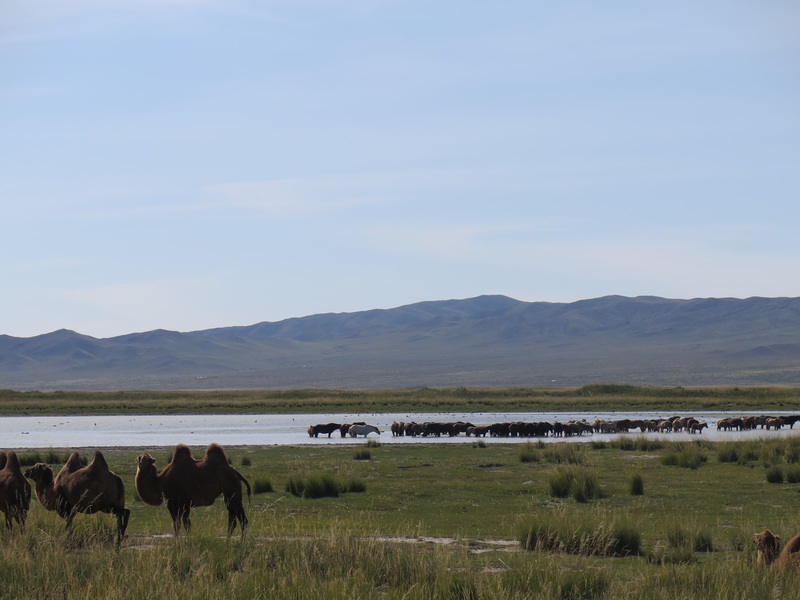 Everywhere we go outside of the city–and I mean everywhere–herds of cattle, sheep, goats, horses, and sometimes camels wander seemingly unhindered. There are no fences. Now and then we would see a man on a horse or a motorcycle guiding them somewhere, but for the most part they roamed free, crossing roads at will. When Ogi honked, they would skedaddle across the road, although not always using the most direct route. This was the first time we saw camels. They were just hanging out, no people in site. One morning we saw a fox run across the road. He ran across, stopped, and then just hung out, giving us plenty of time to take pictures. He must have been quite young. We also saw eagles at Lake Ogii. Unfortunately, none of my pictures turned out well. 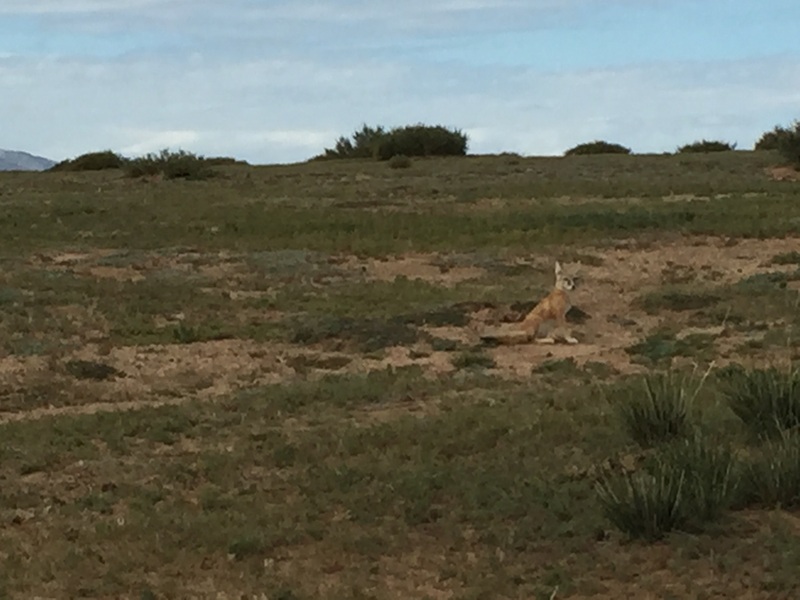 But that’s a fox, hanging out, not 100 feet from the road. OK, so this one’s cheating a bit, but I saw the eagles in the wild, too. Mongolians eat a lot of meat. Not so many veggies. This is fun in the short term but in the long term feels quite heavy. Meg went heavy on the veggies when she cooked, and that was really great. Although I remember thinking that Ulaanbaatar looked washed out and pale when we flew in, Mongolians love color. (This is what Meg told me.) You can see this inside the gers and in the artwork, but where it really struck me was in the roofs of the buildings in small towns. Incredibly colorful. I love the colors in this. I took this holding my camera out the window while bouncing all over the truck. It’s a miracle it came out at all in focus.